I had a lot of fun reading this. Josie is bright and snappy, while Alfie is calm and reasoning - together they make a great team. Though just 13 years old, they go through the very depths of hell, caught up in the whirl-wind of their guardians past of mystery and power. 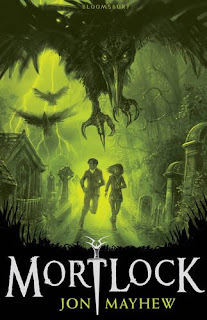 Set in a dark and dangerous Victorian London they are ruthlessly hunted through the streets by the 'Aunts' (who are just down-right creepy) and their ghoulish crow-minions. There are some parts in the story which are truly frightening and I realised this is becoming a common theme in a lot of younger children's these days - and I think this is a good thing. Kids are growing up in a very different world these days and their capacity of understanding what they see on the television or on the streets is much more than we give them credit for. And that's one of the beauties of books - they not only provide entertainment - they help us understand ourselves, our world around us and even why we do the things we do. I cannot wait for this book to be released and I do hope there is room for a sequel. Published by Bloomsbury - April 2010. Thanks for the enthusiastic and positive response! I'm glad you enjoyed it!